Another type of material has been found by researchers that is tied to the meltdowns at Fukushima Daiichi. We have reported extensively over the years on the finding of “black stuff” around mainland Japan. This is a highly radioactive black sand like material that had gathered in gutters and roads as far away as Tokyo. Analysis of materials of that type has linked them to the meltdowns inside the reactors at Fukushima Daiichi. This new finding is also linked directly to the reactor meltdowns. 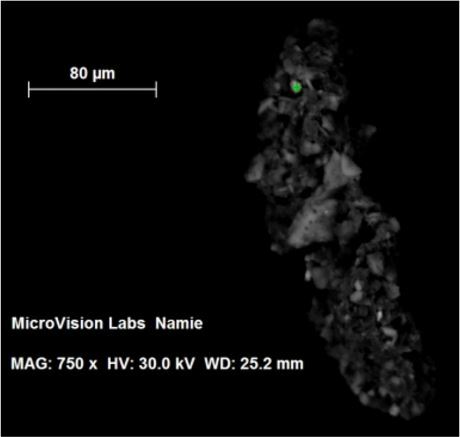 Researchers in Japan found new materials they described as tiny spherical glass particle that was highly radioactive. These glass particles are structurally quite different from the “black stuff” but they also bear a link back to the reactor meltdowns. A glass particle labeled NWC-1 was collected from Nihonmatsu in 2011 after the initial disaster. Nihonmatsu is roughly 40-45 km directly west of Fukushima Daiichi. The town area sits south of Fukushima City and north of Koriyama. This area is well outside the evacuation zone and is currently occupied without restriction. These glass particles include high levels of radioactive cesium. 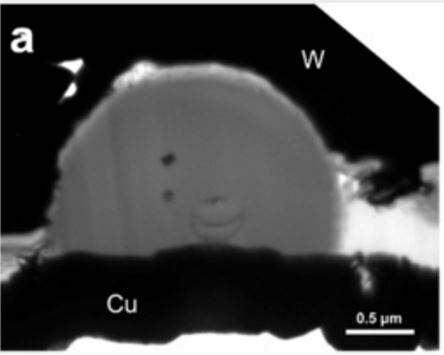 Researchers found that the radioactivity was highest in the center of the particle, indicating the cesium was incorporated into the glass particle during the molten phase of the meltdown. The glass particle also contains materials that indicate it includes either concrete from the containment vessel or seawater that was injected. This is significant as it shows this material was formed after the melted fuel burned through the reactor vessel and had begun burning the containment vessel concrete floor, or it formed after seawater was injected. The seawater injections were fairly late in the meltdown progression and newer research shows all or most of that water flowed the wrong direction and didn’t make it to the reactor vessels. The timing of the creation of these glass spheres would be between the time of the first reactor vessel failure and the start of seawater injection then thereafter. This may help in the future to identify the specific reactor and event that may have created these spheres. The location of the found particle in Nihonmatsu is unexpected. A second glass sphere was found on a cedar leaf in Fukushima, specific area not mentioned. 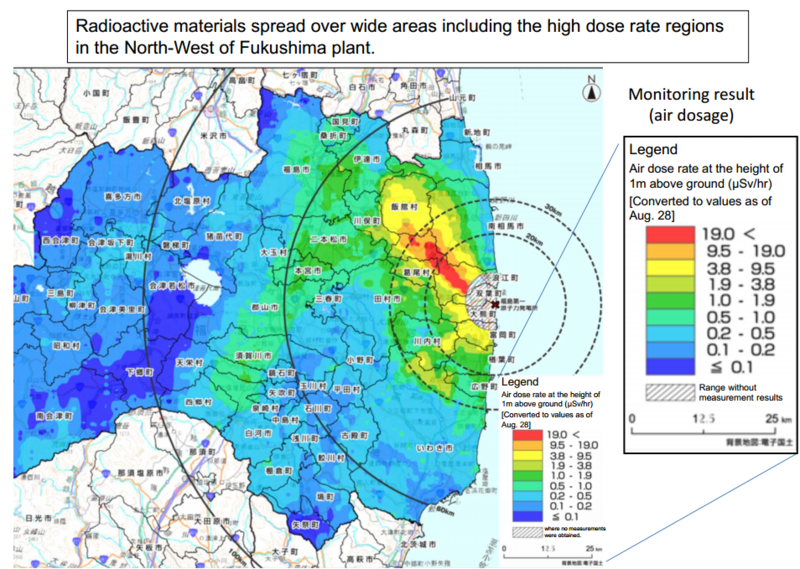 Nihonmatsu is directly west of the plant and not in the documented plume paths that developed north-west and south of the disaster site. This appears to indicate that materials from the reactors themselves were transported far further than initially claimed. These glass particles are small enough in size to potentially be inhaled. Right now researchers do not know the extent or geographic spread of this material. It does show that direct materials from inside the reactors did leave the buildings and were distributed over a long distance. Due to the high radioactivity within these glass spheres they could pose a significant health risk. We put together a rough comparison of the properties of the two reactor meltdown byproducts. This is not a definitive list. Please refer to the original studies for further information. 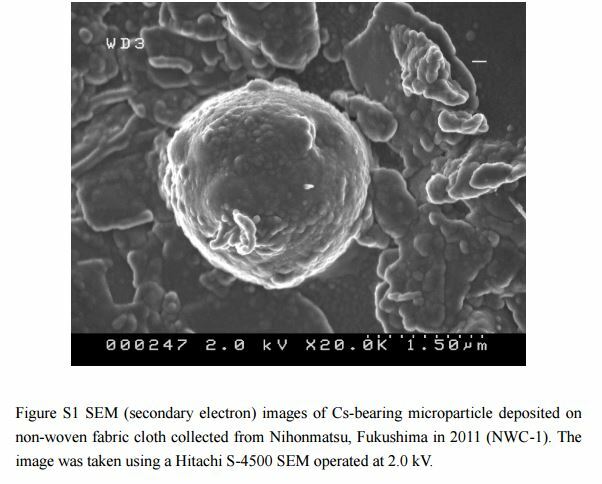 Internal structure of cesium-bearing radioactive microparticles released from Fukushima nuclear power plant. Sci. Rep. 6, 20548; doi: 10.1038/srep20548 (2016).